A retired police officer who shot a suspected shoplifter in the neck at a Riverside home improvement store was arrested, police said Sunday. 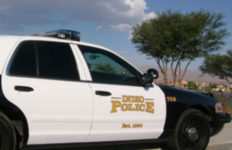 The shooting was reported at about 4 p.m. Saturday at the Home Depot at 3323 Madison St., according to Riverside City police. Initial reports indicate that the confrontation began when a man tried to leave the store without paying for merchandise and was stopped by a security guard. That’s when the retired police officer stepped in, identified himself and allegedly drew a handgun. The suspected shoplifter fled to a getaway vehicle despite being commanded to stop by the retired officer, police said. The retired officer then allegedly shot twice at the suspected shoplifter, who by then was inside his vehicle. The man was grazed in the neck by one of the bullets, suffered non-life threatening injuries and was able to drive himself to a nearby medical facility for treatment. The retired officer stayed at the scene and cooperated with investigators, who determined the shooting was not justified. He was arrested on suspicion of assault with a deadly weapon and was identified only as having been employed by a municipal police department in Los Angeles County. The man who was shot was expected to receive a misdemeanor citation for shoplifting, police said.